Are you an early career scientist preparing to present your research at the DPS 48/EPSC 11 meeting? Are you nervous? Are you looking for advice? Join others like you for this educational opportunity to receive feedback from seasoned presenters! Participants in the Early Career Presenters Review have the opportunity to present their DPS 48/EPSC 11 oral or poster presentation and receive feedback before presenting during the regular meeting. In addition to presenting their research, participants have the opportunity to network with their peers and future colleagues. Early career scientists wishing to participate in this opportunity may register at https://www.surveymonkey.com/r/dps2016_early_career. The deadline to register is 5:00pm Central Time, October 12, 2016. Registration is limited to 20 presenters. 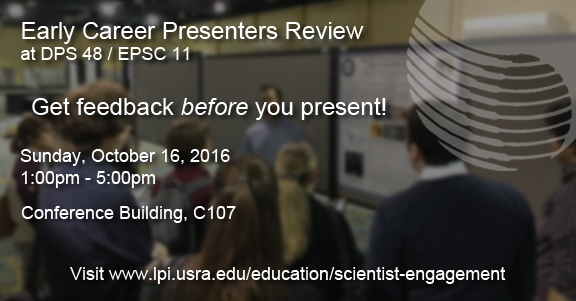 Scientists wishing to participate by providing feedback to the early career presenters should contact Andy Shaner at shaner@lpi.usra.edu. This entry was posted in Student Opportunities on 2016-09-26 by Julie Tygielski.